in the rectangles between them. Type in the missing numbers according to the rule. You can earn a Transum Trophy for correctly completing eight arithmagons at any one level. You are currently working on Level 1: The basic arithmagon, three single digit numbers given in circles. The numbers in the rectangles are the sum of the two adjacent circle numbers. You have earned a trophy for this level but there are more levels for you to try! By working through these challenges you will discover the hidden secrets of Arithmagons. You will find the connections between the numbers in rectangles and the numbers in circles and in doing so develop strategies for solving the more difficult Arithmagon puzzles. This activity is suitable for pupils of a wide range of abilities. It provides purposeful numeracy practice and levels that are a multiple of four (Level 4, Level 8, Level 12 etc.) encourage pupils to devise efficient solving strategies. The subtraction or difference Arithmagons with only the rectangle numbers given (Levels 12, 24, 36 and 48) have an infinite number of correct solutions and the computer will allow any one of these correct solutions. In his pdf eBook Rich Starting Points for A Level Core Mathematics www.risps.co.uk Jonny Griffiths says that "there is no better way to present ideas of doing and undoing than arithmogons. They have been around a long time: 1975 is the first reference I have for them, but I daresay they have been around longer than that. One of their many marvellous aspects is that they require few words. John Mason and Sue Johnston-Wilder (Designing and Using Mathematical Tasks) give a long and fascinating study of how simple arithmogons can be used in a variety of ways." Arrange numbers on the function machines to link the given input numbers to the correct output. Find the five numbers which when added or multiplied together in pairs to produce the given sums or products. There are many more puzzles on the Transum Puzzle page. "Don't be content with only completing the first level of this challenge, click the 'More Levels' tab to select more difficult puzzles. Try the 'Two digit numbers', 'Addition', 'Three rectangle values only' combination to produce some interesting arithmagons.."
Do you know the origin of the title 'Arithmagons'? This activity has been used in schools for many years but who is the person we should thank for dreaming up the idea? This is quite a challenging number grouping puzzle requiring a knowledge of prime, square and triangular numbers. Find all of the possible ways of making the magic total from the numbers in this four by four magic square. The first Arithmagon you will see is a triangle with three circles at its vertices and rectangles on its sides. 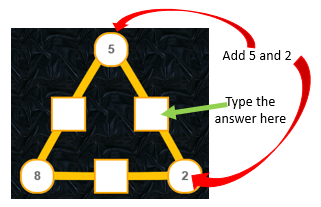 The idea is to add up the two numbers in circles at either end of a side of a triangle and type the answer into the rectangle on the middle of that side. Click the check button when you have filled in all three rectangles. If you are correct you will see one slice of a pie chart showing your progress so far. Complete eight Arithmagons to earn a Transum Trophy. This first level you should find very easy. It gets more difficult when you are not given the three circle numbers but are given the rectangle numbers instead. That’s when you need to come up with a strategy!